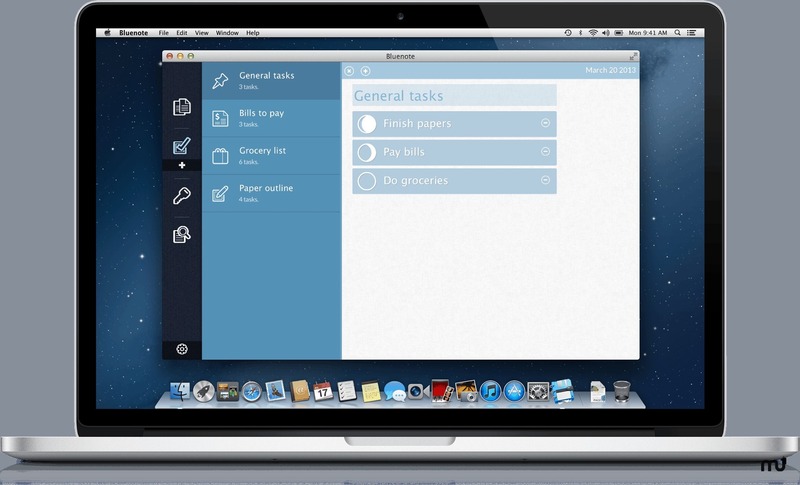 Easily keep track of notes, tasks, and passwords. Is there a better alternative to Bluenote? Is Bluenote really the best app in Productivity category? Will Bluenote work good on macOS 10.13.4? 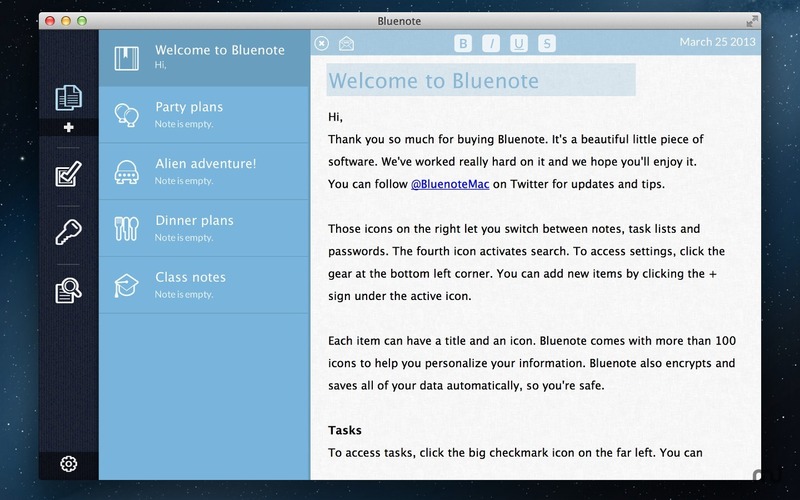 Bluenote is one place for jotting down notes, keeping track of your tasks, and accessing your passwords. A beautiful interface separates your info, lets you assign labels and icons, and search with ease. Bluenote automatically encrypts, saves, and syncs on the fly. It's a fantastic app, exclusively for Mac. 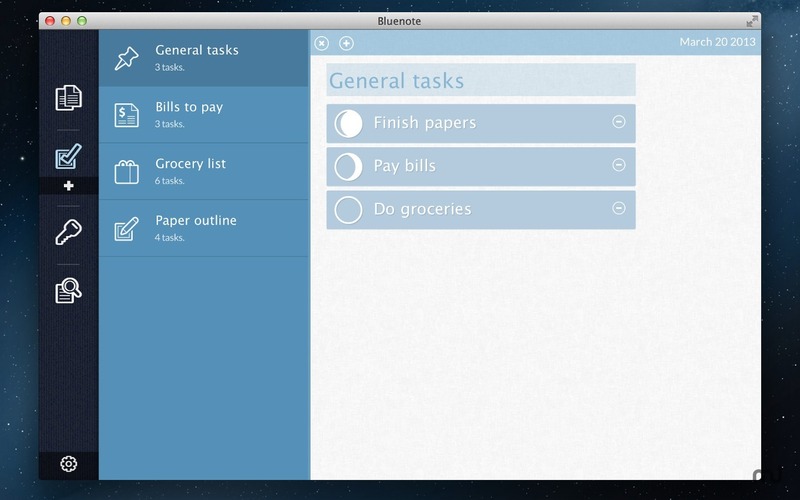 Notes are easy to organize, sort, and label with icons in Bluenote's notepad. Your data syncs safely across your Dropbox account, so that all your Macs are up to date. Keep track of your accomplishments for the day and figure out what's next. 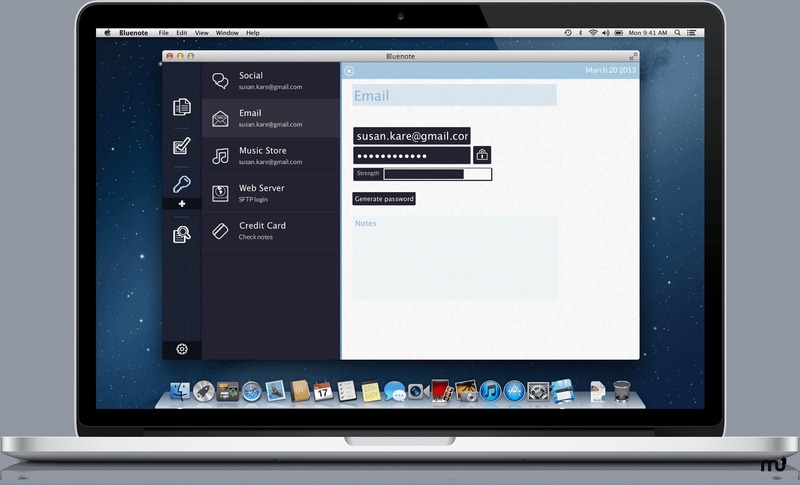 Safely store and manage your passwords for Email, Facebook and more with the Bluenote password manager. 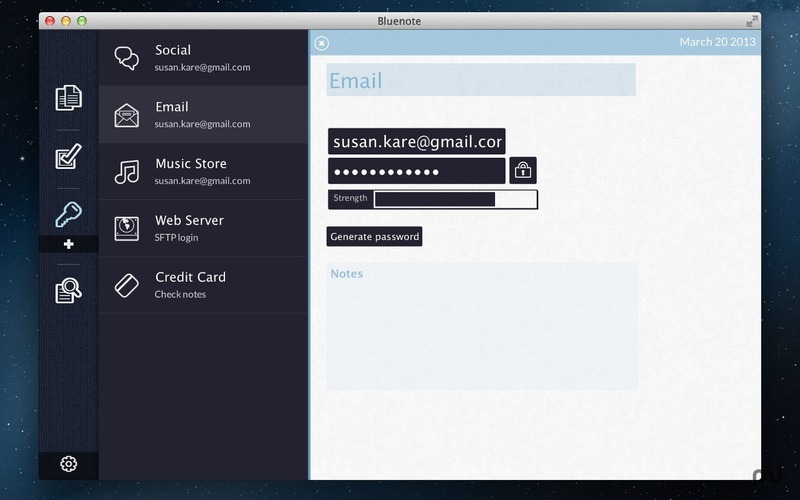 Bluenote uses heuristics and dictionaries to distinguish your good passwords from bad ones. Use the Bluenote Quick Search to find what you're looking for the moment you begin typing in the search bar. There's no save button, Bluenote encrypts and stores everything automatically. Bluenote comes with a large collection of 100+ beautiful icons to help you label and organize your data. Bluenote secures your information before storing it using strong encryption. Full Screen editing lets you focus on your tasks, without any distractions. Keyboard macros let you quickly switch categories lock your session, and more. No Useless Features, Bluenote will never let you tweet your notes or sing them as karaoke. We deliver what matters.